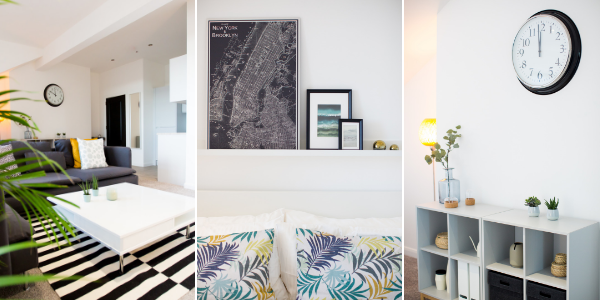 Show Apartment is fully complete and ready for viewings. Please call Jenny on 07931473557 if you would like to book an appointment. Front Building (30-21) The Apartments located on the third and second floor now all have the second fix joinery completed, this means that the kitchens are fitted, coving restored, skirting boards, doors and windows installed. They have (nearly) all been painted and snagged and are just waiting for carpets to be fitted. The ground floor has been plastered and is waiting for the kitchens to be fitted and painting etc. Rear Building (20-1) All of the apartments to the rear are at quite different stages. The apartments in the middle (ie. number 19-14) are ready to start second fix joinery - doors, skirtings, kitchens. Second fix has just completed in the rear building, this covers the electrics, plumbing and heat recovery system in the basement level. As with all of our builds, the interior building works have commenced on the top floor first. 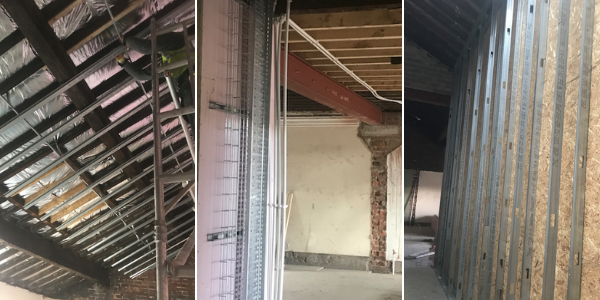 The partitions have now started to go in on the second floor, and now that the new roof is complete and almost fully insulated, the new ceilings will be next to be installed - the new windows have also been fitted. Once complete, the partition walls will be erected on the first floor and then ground. The electricians will then arrive on site to begin the first fix electrics on the second floor. 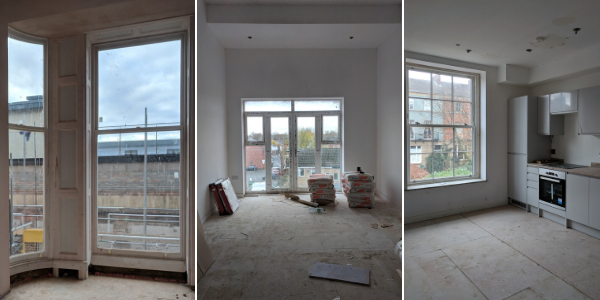 When the partition walls are up throughout the building, individual apartment layouts become much more apparent, and you start to get a good idea of the space and quality of light. The brick work will start this week to build up the extension to the rear which should go up quickly. 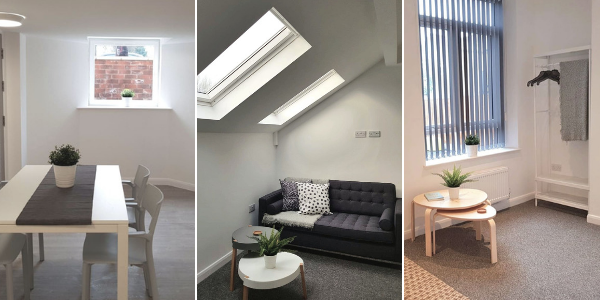 We have just completed two HMO's in Manchester which have been furnished ready for a lettings open day. Both HMO's are comprise of 8 studios with ensuites and a large communal kitchen with dining space.